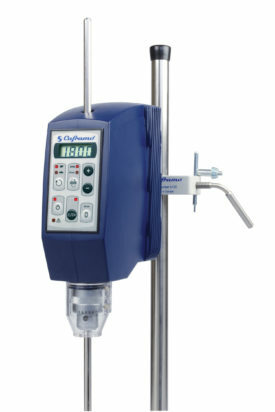 Caframo offers three models of high torque overhead stirrers for a wide range of volumes and viscosities. All models come with 3 years warranty and brushless DC motors so they are maintainance free. BDC1850 Overhead stirrer motor 120 volts, 60 Hz. Includes support rod, chuck, chuck key, chuck guard, grounded North American power cord, and printed manual. BDC1850220U1 Overhead stirrer motor 220-240 volts, 50/60 Hz. Includes support rod, chuck, chuck key, chuck guard, UK and EU cord sets, and printed manual. BDC1850220AU Overhead stirrer motor 220-240 volts, 50/60 Hz. Includes support rod, chuck, chuck key, chuck guard, Australia cord set, and printed manual.